Looking for a cute little lunch spot in Midtown Atlanta? Chick-a-Biddy recently opened in Atlantic Station (right across from the movie theater), and it totally fits the bill for a workweek lunch outing. They serve mainly chicken, and they have very interesting sides. I had a hankering for some mac n cheese with my fried chicken, but I guess that’s a tad too Southern for what they’re going for here. The inside of the restaurant is so clean and bright, and I really enjoy the giant chickens on the wall. I chose the chicken tender basket, which came with 2 sides — I chose the watermelon/feta salad and fries. Both were really good. The salad was cold and refreshing, which was a nice counter to the hot and salty fries. Oh, and the chx tenders are hidden in that bowl under the fries, in case you were wondering. They also include a wasabi honey as a dipping sauce. Yum. If you have ever been to Yeah! Burger in Atlanta, you’ll recognize the metal trays and fun paper liners. 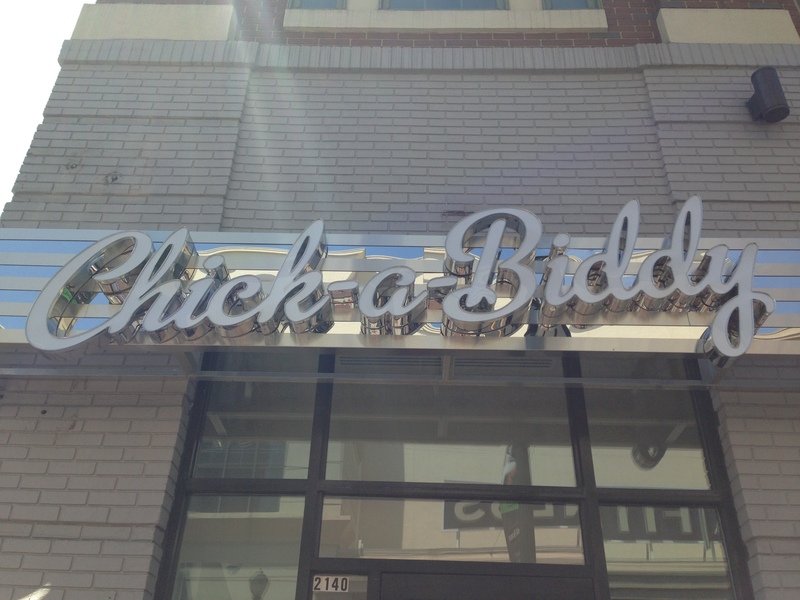 Chick-a-Biddy was started by the same folks from said delicious burger joint, and I’m a definite fan of both.